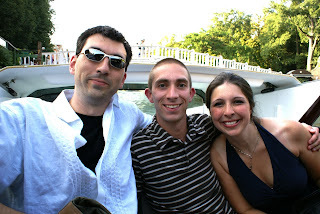 Juliet's Balcony in Verona Chris and I on one of the many bridges of Venice Jason, Chris and I in the private water taxi on the way to dinner One of the 3 orchestras in Saint Mark's Square Artists were set up everywhere selling their work. 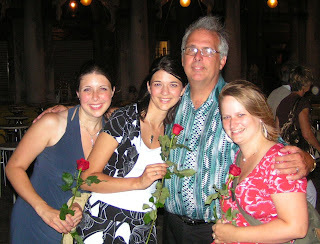 Dad bought all of us girls roses at Saint Mark's Square. Today is the day I have been looking forward to! VENICE here we come! I was so excited. We stopped in Verona, first, which is where Romeo and Juliet took place. I was surprised to learn that Romeo and Juliet’s families were actually real families in the 1300’s. They don’t know if the story is true or not, but they do know that the families were both in Verona at that time. Shakespeare didn’t ever visit Verona, so it could just be a made up story. 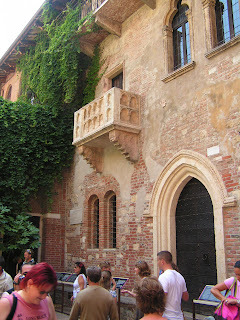 Anyhow, we saw where Juliet’s family lived and saw the balcony where it is rumored she cried, “Romeo, Romeo, wherefore-art thou, Romeo?” There’s not too much else to Verona. We shared a calzone and just walked around. We got to Venice around 3:00. Interestingly, we didn’t stay in the traditional Venice. It has spread to the mainland now. They call it Venice II. That’s where we stayed, very close to the bridge that leads to the 120 islands of the original Venice. We took a nap and then gathered at 5:00 to go into the city. There was an accident on the bridge, though, so we were a bit delayed. At truck had hit the curb and tipped, dropping washing machines all over the road and into the lagoon. It was a mess. 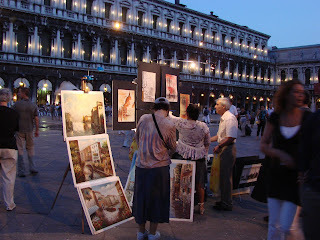 But we made it into Venice and enjoyed our evening immensely. Tonight was a perfect night! 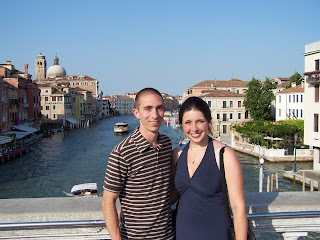 Our entire family opted to take the "Venetian Night Out" excursion, and I am so very glad that we did! It was the stuff of fairy tales. We took private water taxis to Saint Mark's Square which was so much fun. We stood at the back of the boat, let the wind blow through our hair, and enjoyed the beautiful canals and waterways that run between all the buildings. We had dinner in a small restaurant where we were serenaded by a lovely man playing guitar all dressed up in a red and white striped shirt and a blue bandana. We could have all the drinks we wanted, so our waiters laughed at us that we asked for the "American wine," coke, instead of the white and red wine that was placed on our tables. Dinner was fabulous. We purchased an optional meal in Venice at an exclusive restaurant there. They had music and a 7 course meal. It was delicious. Chris ate salmon and I had veal. It was over by 9:00, so Chris and I walked out into Saint Mark's Square and were immediately struck with the romance of Venice. It was wonderful. 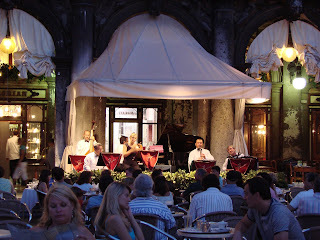 The square was dimly lit by little lights all around the square and in three locations, there were orchestras playing. People stood with their arms around each other, taking in the ambience, and they would spontaneously dance. All over the square. Chris even danced with me. Dad bought all of us girls roses to thank us for being part of his ministry, which just added to the romance of it all. It was a perfect night. We took a private water taxi back to where we could catch our bus. Chris and I stood up in the taxi in the back so we could see the gorgeous scenery. It was so much fun to look down the various canals and see all of the water which led right up to the doors of the buildings. They must flood all the time. But it is beautiful. We had a lovely night. And we slept very well.